Every Tuesday night a local outfitter has a kayaking paddle out of Barcelona harbor. I got lucky with this photograph of the kayakers that where about 2 miles east of Barcelona Harbor on Lake Erie in Westfield New York. The timing of the sunset and the location and the route that the kayakers took this night all worked out to help with the success of this image. I also used the longest focal length lens that I could and still get the framing I was looking for in the final image. 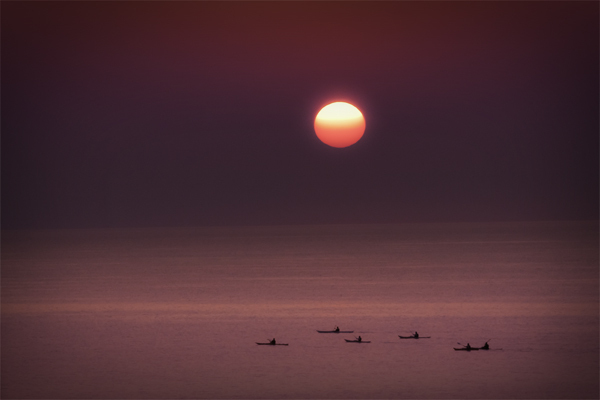 The long lens compresses the distance between the kayakers and the sunset. There is a little color shift done in photoshop to enhance the colors that where already present. Sunsets on Lake Erie have been a frequent subject this summer.